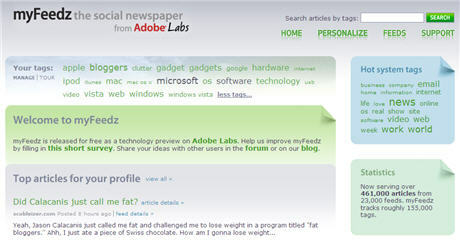 Adobe has officially stepped into the RSS news aggregator business with the launch of myFeedz on Adobe Labs. Unlike other web based RSS readers like Google Reader or Bloglines, myFeeds tries to learn from what you read regularly and accordingly displays news items / blog posts that might be of interest to you. myFeedz can read a list of your favorite feeds (via OPML files) and give you a personalized river of news view. Another useful feature is that you can sort articles by date or by popularity. Your reading history is also taken into account while calculating what stories are more relevant for you. myFeedz was initially a product of InterAKT who made some of the most popular extensions for Macromedia Dreamweaver. Adobe recently acquired InterAKT and released myFeedz on Adobe Labs. It is not immediately known how Adobe plans to monetize myFeedz in future. The site is currently free of advertisements but they might use the same contextual ad inventory planned for Adobe Digital Editions.